The SEALIFE Centre is situated along the seafront next to the Wellington Pier. I thought that where the aquarium is situated is perfect as there were more than enough space available for parking, one was even two minutes away. After a few photos, we then walked in and was greeted by a very friendly receptionist who was only too happy to tell us about the exciting adventures inside. We were handed some leaflets to tell us the feeding times and a 'Dive Logbook' whilst we were collecting our tickets and getting our hands stamped. Throughout the aquarium our daughter had to find nine stamping stations and then hand them into a cashier in the gift shop for a special treat before our departure. So, armed with our leaflets, map and 'Dive Logbook' we entered the aquarium. We were greeted by a very friendly photographer who kindly offered us a seat with a green screen behind us to take some souvenir photos that we could collect at the end of the aquarium. 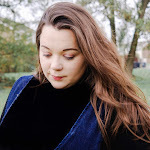 The cheeky photographer took a few photos that I wasn't quite ready for, I needed to be in selfie mode, but it's one we can look back on and laugh at. We then entered 'The Shipwreck' and despite it being extremely dark our daughter coped really well and was completely fascinated. Even more so, as we come to the 'Jellyfish' tanks. Jellyfish are older than all of our ancient reptiles. Scientists believe they first swam in our oceans around 500 million years ago! There are more than 350 different species of jellyfish. That's pretty interesting. It was so lovely to watch my daughter going from tank to tank asking what was in there. 'Under The Ray-Dar', new for 2017 gave us a chance to step into a research submarine and come face to face with the native RAYS. We could also interact with the multi-sensory touch points to learn more about other sea creatures from the UK coast line and find out how to get involved in the amazing conservation projects SEA LIFE supports! We all loved going through the submarine as we could watch some of the sea life though the portholes, it was quite fascinating. Just on the other side of the submarine there was a supervised rock pool full of starfish and crabs. I was a little apprehensive when a member of staff encouraged my daughter to touch one, and when he wasn't looking she picked up the poor little starfish and dropped the poor fella. I did imagine that she would freak out and scream but she was very brave and even got a medal for being so brave. Next stop in the aquarium was the 'penguins', which was the part I was looking forward to the most. We had timed our visit perfectly as the keepers were about to give a talk and feed the penguins, we couldn't wait to get a good view looking down onto the enclosure. These Humboldt Penguins are named after the Humboldt Current they are native too, located in Peru. Many people find it hard to believe that these penguins love sunshine and warm weather! All three of us enjoyed watching them getting in and out of the water, it was like they were doing it on purpose. They clearly knew how to work the crowd!!! Our next stop was back through to see the 'Sea Life Nursery' and into the 'Tropical Rainforest', which amazingly is home to more than half of the earth's planets and animals. It was in here where we met two African Dwarf crocodiles, Ntombi and Masozi, one of the sisters were trying to be clever with their hiding place, but our daughter soon sussed her out. After saying goodbye to 'snap, snap' we were then mesmerised by the beautiful tropical fish from the tanks. We then came to 'Dragon's Den' which highlights some creatures than have been around for many years. My husband fell in love with the Terrapins, there was one little fella who clearly loved camera time, as every time I moved with my phone he followed, but wouldn't stay still long enough for a decent picture, which was a shame. The ultimate highlight for us all was heading towards 'Ocean Tunnel' which was themed just like the lost world of Atlantis, it was very impressive. A huge million-litre underwater tank, as you approach it you are met by a wall of glass where you literally come face to face with all the Sealife. Then you walked through a tunnel for the ultimate sea life experience with sharks, sea turtles and other magnificent sea creatures. After spending some time discovering all the Sealife walking through 'Ocean Tunnel' we then headed through to meet a few more creatures at the 'Pirate Reef' where we were excited to discover all about the Oceans different coral reef in the most amazing displays. All the displays in 'Pirate Reef' allowed us to see them in their natural eco system and some of its beautiful residents. I do have to say that for me, the seahorse tank was magnificent I think I could have stayed there for hours. Many of the Seahorses were pregnant and trying to explain to a three year old that the males carry their babies was a strange one. We then came to a little 'Conservation Room' where our daughter could take some time to have a quick drink and colour a few pictures of Nemo and Dory, while an educational DVD about the Sea Life Marine Conservation Trust was playing in the background. After a little while we went in search of 'Nemo's Cave' and found a giant turtle where we all immediately tried to reach an touch the magic pearl. Even with a little help, our daughter's arms were far too small to try and reach for the pearl, perhaps next year! 'Nemo's Cave' was so much fun. 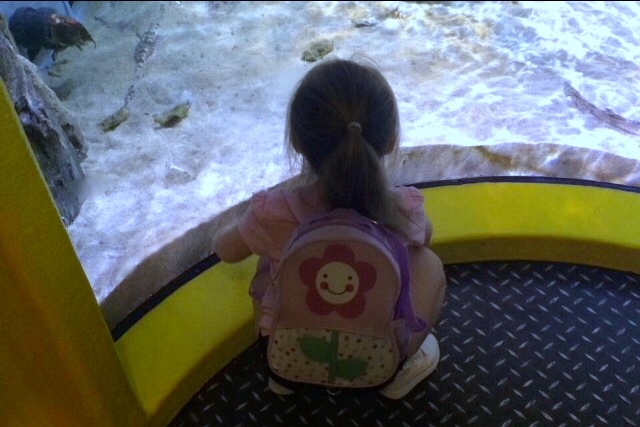 Our daughter, like so many other children is completely obsessed about Finding Nemo and Finding Dory so when we came to Nemo's Cave we couldn't wait to explore. My husband and I took it in turns to explore the cave while the other one took photographs, these will be great ones to look back on when little one is older. After some fun in the cave we then looked around all the fish tanks that were full of Nemo's, our daughter has asked if she can have a fish for home. So, that's something for her Christmas list! The final area at the aquarium is 'Sea Stars' and it shows the wonders of star fish. My daughter really loved this area as it was crammed full of amazing facts about starfish. There were many different shaped and coloured star fish and watching them going explore was lots of fun. We then collected our photos from the start of our Sea Life journey and made our way into the gift shop to go and collect our special surprise. 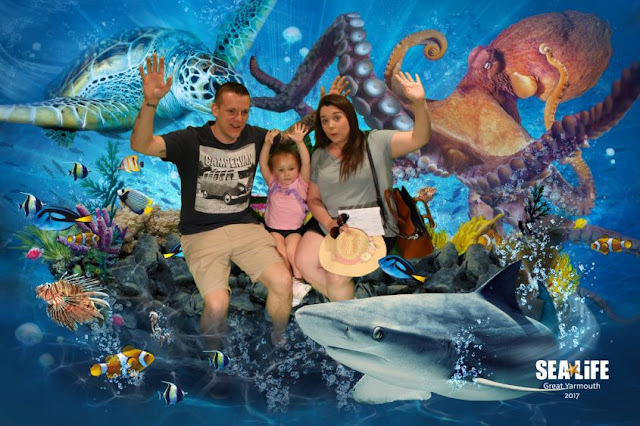 Our day at the Sealife Centre, Great Yarmouth was amazing, I don't think I could recommend it enough it's the perfect day out for all of the family. There are so many fascinating creatures to discover and to learn about, which made the day so much more worthwhile. 2 comments on "Explore The Adventure: Sealife Great Yarmouth"
I love aquariums, they are so fascinating and great for all ages. This one looks really well set up - I love the idea of the dive stations, so engaging for children. The submarine looks fantastic too. Glad you all had a great time!